I read Funke's Inkheart and loved it. (I read the sequel, Inkspell, and did not enjoy that as much and so am not going to read the final book in the Inkheart triology. Feel free to tell me how it all ends.) I read The Thief Lord and loved that. 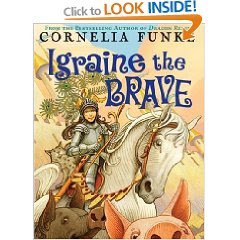 So when I came across Igraine the Brave (which I hadn't heard of) I lept upon it with a heart full of glee. Alas, it didn't really live up to my expectations which is always a disappointing thing to realize. I didn't not like the book. I am just not really sure what to make of it. On the one hand, it is entertaining, imaginative, and compelling. It is the story of a young girl, Igraine, who dreams of being a knight. Her family's magical castle is under attack and she is fighting with her family to save it. There are wicked knights as well as noble hearted ones. In fact, I found the book to be quite chivalrous, even opening with the good knight's Rules of Chivalry. Never turn your fighting skills against weaker opponents. Use your sword only in self-defense or defense of others -- never to enrich yourself. And MOST IMPORTANT: Always remember that your opponent may not be keeping the rules himself. P.S. A knight can never lose his honor in a fair fight. I find lots to agree with within those rules. It is truly the noble knight who plays by the rules and places others above himself, expressing consideration for those weaker than himself. In these respects, I find this book to be engaging and full of truths which make for good discussion. On the other hand, this book does have a lot of magic in it. I'm still unsettled as to whether I agree that magic makes for good subject matter. In the case of Narnia, I understand its use and support it. In the case of Harry Potter I find it mildly disturbing (and don't really understand it's purpose maybe?). As I was reading Igraine I had the impression of the use of magic in this book being presented in a rather "harmless" way in that Funke made the use of it almost goofy at times. (For example, Igraine's parents accidentally turn themselves into pigs, negating their magical powers and they spend most of the book focusing on turning back into humans and magicians once again.) I think I don't mind magic when the way it is used in a story clearly defines the difference between good and evil. It needs to be handled in an artful way, if you will, skillfully describing the powers in force without being terrifyingly frightening. Because this book almost made a joke out of the use of magic, I'm not really sure I am ok with it. (Does this even make sense?) In other words, it came across as being neither scary nor deep. It was used purely for entertainment and I'm not sure what I think about that. Secondly, well, there's the fact that Igraine is indeed bucking the norms of the day, as a girl who hates wearing dresses and wants to be a knight. It erases the need for male leadership but Igraine is the type of character people love to love these days. Basically, I don't feel strongly enough about this book in either direction. I think it has its very good points and its very bad points. This is one that I think depends on individual comfort level. It IS entertaining. It DOES have issues. I could take it or leave it. P.S. I still like Funke. I am coming to the conclusion that it's hit or miss with her books though as to whether or not I will love them. She seems to have both gems and doozies. Okay. Seriously. :) I agree with your assessment of and uncomfortableness with Harry Potter, and thus Funke's usage here. (I haven't read anything of her books, fyi.) Magic, imo, should be a means by the author to allow stuff to happen for the betterment of the story, not "just for the heck of it." There should be a purpose for it. Because, if you think about it, magic is fiction's way of putting Supernatural happenings in, without having to explain God. Depending on whether this works content-wise (as in Narnia) decides whether the magic helps us feel "comfortable" or not. I thought the Thief Lord was fantastic, while other of her books have not been - glad to hear I'm not alone! I haven't read the Thief Lord yet, I should do that. The trouble with these presentations of girls who want to do non-girl things is that they are such a boring stock character now. Yawn. Here we experience a mild splitting of the ways...as I dearly loved Harry Potter, each time I've read it (and let's just say it's been more than once, perhaps more than twice...). That being said, I never really analyzed the use of magic, just enjoyed it (shallow, I know). You and Veronika impress me! I also loved Inkheart but never got around to the second novel. I DO think we should be careful in how we "accept" magic. Me too, Carrie. I actually started the first HP, really just to silence the arguments of others who said I should. Got through the first several chapters...and stopped soon after. It's just too "I am all poweful because I have magic!" and I didn't like it. I honestly couldn't read that kind of book with Christ sitting in the room, lemme tell ya.